"There were giants in the earth in those days; and also after that, when the sons of God came in unto the daughters of men, and they bare children to them, the same became mighty men which were of old, men of renown" - (GENESIS 6:4). 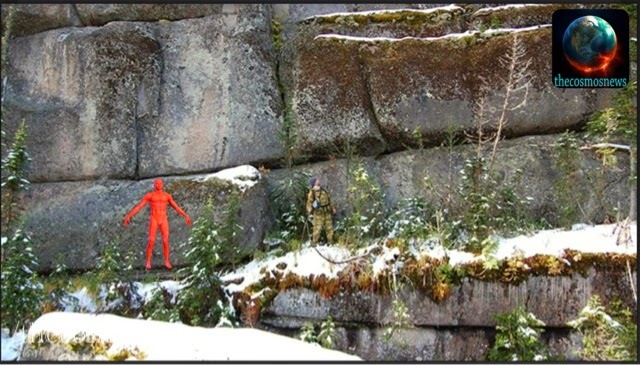 An ancient Super Megalith has been found in the Siberian Mountains. How where they made? Some are questioning if they were just naturally made. Of course this idea fly’s in the face of conventional wisdom. For students of the Bible the mysteries of these Megalith and its creations are easily explained away. There is no conventional machinery that can move these objects. The pyramids of Egypt’s and the ruins of Baalbek are structures that defy modern technological limits on Machinery. Does the Ancient Alien theory hold any weight to the construction of these amazing structures? The Bible mentions that there were Giants in the Earth. These Literal Giants creatures were created as an abomination by the fallen angels who cohabitated with the women of Earth. They created a Hybrid race to corrupt the Bloodline of Jesus Christ in order to prevent the birth of our lord and Savior Jesus Christ, “ And the LORD God said unto the serpent I will put enmity between thee and the woman, and between thy seed and her seed” ( Genesis 3:14-15).Bible students debate Angels cannot cohabitate because of a passage in Matthew 22:30 , “For in the resurrection they neither marry nor are given in marriage, but are like angels in heaven”. Well I tend to disagree because God has put enmity in THY SEED implying that Satan has a bloodline. God sent a flood to destroy the wicked, but he also sent this flood to destroy the race of Giants that were corrupting the whole Earth and the Bloodline. After the flood these Giants returned, but were affected by the world that had changed physically. I have heard that History is written by winners who refuse to face the facts of truth. Through the annals of history, people have spoken or discovered remains of these Giant people. The Bible speaks of them as Nephilim and like in the days of Noah they are set to return to Earth in one last attempt to destroy its inhabitants and lay claim with Satan as Gods of Earth and Heaven. Daniel 2:43 , “As you saw iron mixed with ceramic clay, they will mingle with the seed of men. But they will not adhere to one another, just as iron does not mix with clay”. Who are the THEY THAT MINGLE WITH SEED? They are none other than the offspring’s of these fallen angels who have left evidence of their presence in Megaliths Structures.